End Poverty Feet First is the message Sam Baio brought to our club. 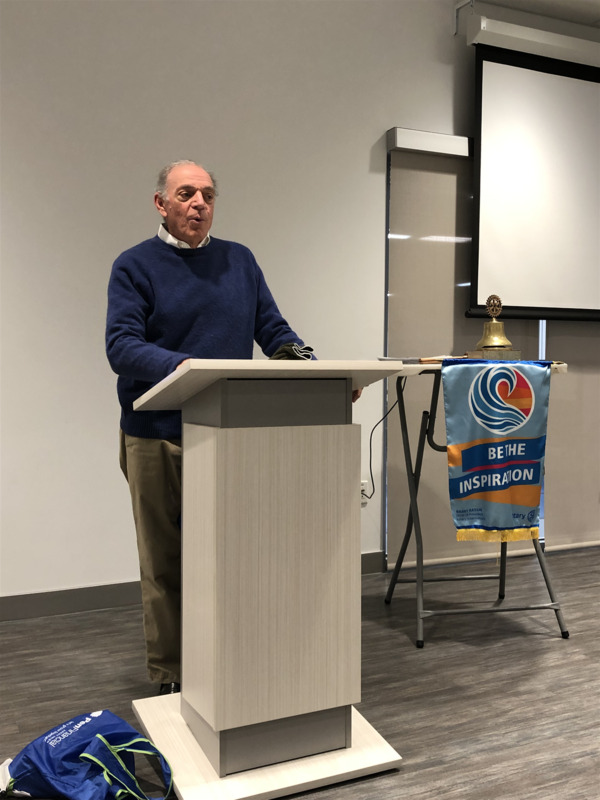 Sam is retired owner of West 49 and philanthropist that discovered a need and then a solution to help keep those less fortunate warm in the winter. As we all know, feet are the first body part to get cold and stay cold. Three years ago, Sam set out to source warm wool socks and other warm winter gear. He found a textile company in Jordan that would knit German wool socks, similar to what our military wears, for a cost of $2 a pair. That is 8 quarters, hence "Socks for Change" was born. In the first year, Sam ordered and delivered 2500 pairs in New York and across Niagara. The following year he ordered 4000 pairs and this is just the tip of the ice berg for need. Sam is making great connections through schools, homeless shelters and community outreach programs. Hats and head gear have also been added to his distributable inventory. All funds raised through donations go directly to cost of sock production. Sam is someone who lives our Rotary motto of "Service Above Self" and we are proud to assist his work any way we can. Donation boxes are located in local businesses such as Pen Financial, Starbucks, Boggio Family Pharmacy and The Post Office.